Important Note: Please note that these naming conventions are only intended for transactions of passing proposal files between unit proposal coordinators and OGCA. Faculty are not expected to use these naming conventions. OGCA only requests that a proposal being submitted via email use the naming convention of S#-Dept-PI Name somewhere in the subject line to facilitate easier tracking of the email, unless sponsor guidelines dictate another naming convention that takes precedence. Documents in the “Working” folder are drafts or backup documentation only that the department uses in preparation of the proposal package. When the department has a proposal needing OGCA review, the action type for the document(s) should be changed to “Review” and placed in the “OGCA Review” folder. Once OGCA reviews a file, the action type will be changed to either “Fix” if changes are needed. Once the department makes the needed changes, the action type should be changed back to “Review”. Once OGCA approves a document, the action type will be marked as “Final” and place in the “Final” folder. These will be the final documents of record. Files can be copied and renamed when application guidelines dictate a specific filename, especially for some Grants.gov submissions. Revisions - Create a new folder for the revision in the base folder of the unit, like a regular proposal. Revision folders use the same naming convention as parent folders with the addition of R1 (R2, R3, R4 etc.) at the end of the S#. If the parent proposal folder is still in the in progress section of the unit folder, the revision folder can be placed inside it for OGCA review. If the parent proposal folder is in the completed proposals section of the unit folder, keep the revision in the in progress section. After review and completion of the revision, OGCA will move the revised proposal folder under the parent proposal folder. Subawards - If UAF will be a subaward on a proposal, put the prime agency in parentheses next to the direct sponsor name. Note that Banner FRAPROP should list the direct sponsor (prime awardee that will sub to UAF) and never the prime sponsor. Sponsor Names - Please do not make up acronyms for sponsor names. OGCA uses specific acronyms for post-award management, and can provide this to you if requested. OGCA must review all components/documents/forms that make up any proposal submitted to the agency/sponsor. OGCA understands that documents may have to be reviewed in pieces due to the nature of the proposal. Before final approval of the proposal, all related documents must be included in the review folder. The naming conventions were developed to ensure consistency internally and externally. If the FOA or Sponsor guidelines require specific document names that will take precedence. Only send out documents that have been reviewed by OGCA as indicated in the proposal folder with (1) the proper naming convention and (2) the extension “Final”. When final documents are sent to agencies and sponsors they should be PDF unless specified as otherwise in the FOA or from the sponsor. Add the following statement within your email and cc: ogca-uaf-preaward@alaska.edu when submitting to the sponsor via email. 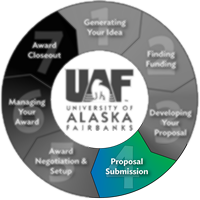 Any administrative correspondence related to the official submission of this proposal should be directed to the University of Alaska Fairbanks, Office of Grants & Contracts Administration at uaf-ogca@alaska.edu. If the information is technical or programmatic in nature please forward to the Principal Investigator. Ultimately, as the authorized organizational representative for UAF, OGCA will need to ensure all documents related to the proposal have been reviewed and approved before submission to the agency. When OGCA reviews documents in Word and Excel format for ease of review and editing, the documents will have to be converted to PDF before submittal to sponsor. OGCA will convert them to PDF copy and save as “Final” in the proposal folder as part of our review and approval process. If the sponsor requests a single file for e-submission, the filename should be tagged as “PROP” per the document type guidelines contained herein, while following the rest of the naming convention. Proposal (final version with all components) PROP This includes a full downloaded copy of the submitted proposal from NSF, NIH, NSPIRES, etc.